Ever wondered what the Tudors ate to celebrate Easter? Well, today we are going to find out. There are some Tudor Easter recipes that are still popular; however, there are also a couple that are much less familiar, if not a little alien looking! Want to know more? Check out our four seasonal recipes below. As the seasons turned, fasting flowed back into feasting. After the punishing 40 days of Lent, Easter was the great release. Easter Sunday is the first Sunday after the full moon that falls on, or after, 21 March. This is a religiously calculated and has nothing to do with the astronomical full moon – and thus, it may bear little relationship to reality. During the Tudor period, Easter was the traditional day for spring cleaning houses and sprinkling floors with fresh rushes and flowers. Easter eggs are mentioned in the records, and consumed in great quantities, but sadly without any culinary specifics. It was also customary to give gifts of spices, food (eggs and meat) and animals at Easter. Edward I distributed eggs like gilded gems to his favourites. In 1200, the Countess of Leicester bought more than a thousand eggs for an Easter feast for her tenants at Dover Castle! In today’s blog, we dive into the world of the Tudors at Easter. We have put together a selection of recipes which are cake, biscuit and egg-based – all of which are closely associated with Easter, and were well known to the Tudors. Unfortunately, many of the original recipes are long lost, and so we will follow recipes that have been slightly adapted over time. Let’s roll up our sleeves and get floury with the first of our Tudor Easter recipes! A tradition that has been almost forgotten, and which is associated with Palm Sunday is the giving of pax cakes. Dating back to at least 1570, these small biscuits were handed out by vicars to their congregations. The cakes carried an impression of a lamb and a flag and were originally buns. The origins of the ritual lies with the family of Thomas More, vicar of Sellack and Kings Caple in 1442. He died on Palm Sunday 1448, leaving a massive £20 to a local charity. To make the batter, beat one egg. Then add and beat the following until smooth : 1 cup of buttermilk, 2 tablespoons olive oil, ½ cup whole wheat flour, ¼ cup wheat germ, ¼ cup white flour, 1 tablespoon sugar, 1 tsp baking powder, ½ tsp bicarbonate of soda, ½ tsp salt. Grease heated skillet or griddle pan. Pour the batter onto the hot griddle in 3-5cm diameter drops. Turn the pax cakes when bubbles show. Heat on the second side until brown. Sprinkle with powdered sugar. Cinnamon may be added if desired. This is a spiced bun dating from medieval times, which became popular with the Tudors. However, there appears to be no earlier recipe than Hannah Glasse’s, found in The Art of Cookery, dating from 1740. The first recording of the medieval cross bun or, ‘St. Albans bun’, goes back to 1361, when a local monk called Thomas Rocliffe first started distributing them on Good Friday to the poor of the city of St. Albans in Hertfordshire. The original medieval recipe is not known, but the bun’s ingredients are wholemeal flour, milk, fresh yeast and grains of paradise or cardamom. The Alban bun claims to be the forerunner of the modern hot cross bun, but the cross is cut into the top of the bun before being backed, rather than piped on top. Superstitions surround this magical bun which is supposed to keep fresh for a whole year if baked and served on Good Friday! In 1595, under Elizabeth I, the London clerk of markets issued a decree forbidding the sale of hot cross buns and other spiced breads except on Good Friday and at burials. The punishment for transgressing this was the forfeiture of all the forbidden product to the poor. This was because the buns were not of a size permitted by law. These restrictions continued until well into the seventeenth century. On Good Friday in 1664, Samuel Pepys noted in his diary, that he had buns (or ‘wiggs’) before he went to bed with some ale and called it a ‘Lenten supper’. These ‘Good Friday’ buns used no fruit and were flavoured with spices such as caraway, nutmeg and coriander. As time passed, and the general affluence of the population increased, the recipe changed such that it began to incorporate dried fruit – at the same time, the spices used became more varied. They were simply called ‘cross buns’ until the first recorded reference to ‘hot’ cross buns in ‘Poor Robin’s Almanac’ in the early 1700s. Make a dough from the ingredients and leave to rise in a warm place. Form balls and place on a baking tray. With a knife cut the cross into the top. Bake in the oven at 200° C for about 15-20 minutes until golden brown. Leave to cool. Now here is a strange ingredient for our Tudor Easter recipes, unfamiliar to most of us, I would imagine. In England, a green coloured omelette, by the name of Tansy, was a popular choice for Easter. This was flavoured with the juices of the perennial yellow-flowered herb Tanacetum vulgare or ‘tansy’. Its stems and foliage are extremely bitter, associating it with the herbs customarily eaten on Easter Day as a remembrance of the bitter herbs traditionally eaten by Jews at Passover. Contemporary documents record that at Easter archbishops and bishops played handball with men of their congregations, and a ‘tansy’ cake was the reward for the victors. Another record states that in the spring of 1559, six pennyworth of wild tansy was purchased at Epsom for the Earl of Leicester. In 1656, Coles wrote about the origin of eating tansey in the spring. He states that it was very wholesome after all the salt-fish consumed during Lent, and it counteracted the ill effects which the ‘moist and cold constitution of winter has made on people… though many understand it not, and some simple people take it for a matter of superstition to do so’. The young leaves of the herb tansy develop toxins with the increasing warmth and sunshine in the spring and should therefore be AVOIDED. Traditionally, tansy was used to free the bowel of worms! 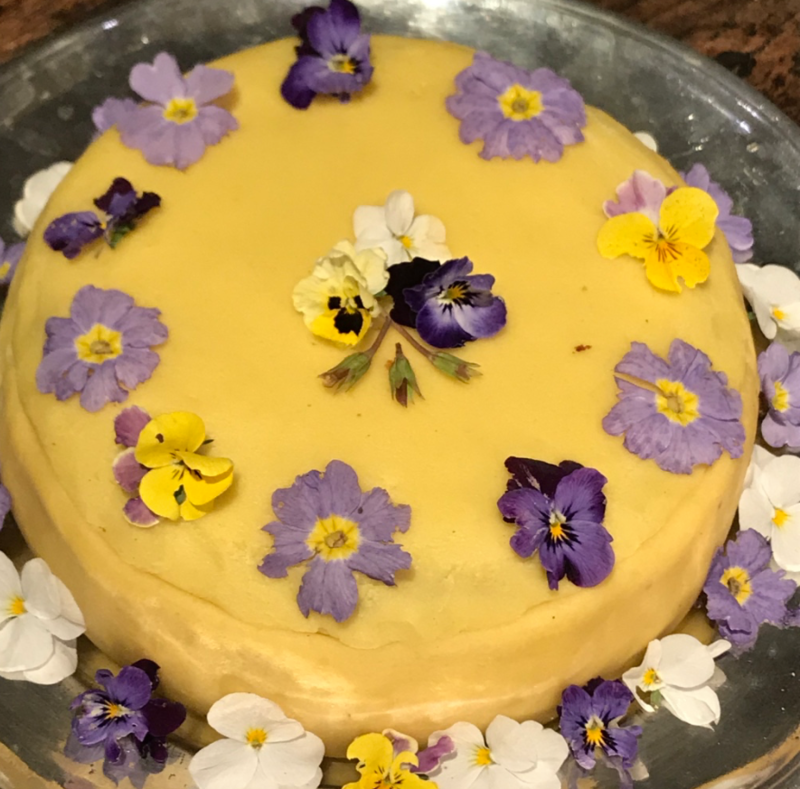 Although it is unlikely that many (if any) of us can get hold of tansy, because of its toxicity, we will not be including a recipe here, but we have included a photo so you can see how extraordinary the dish would have looked! This cake was originally made for the middle Sunday of Lent, when the 40 days fast was relaxed. This was known as ‘Laetare Sunday’, ‘Mothering Sunday’ and ‘Simnel Sunday’. This was the day when the congregations of the daughter churches of the parish went to the mother church (often the abbey), bringing a large congregation together. In the seventeenth century, boys & girls in service were allowed to go home and visit their mother. Simnel cakes have been baked since the Middle Ages and it is believed that the word comes from the Latin ‘simila’ (a very fine flour made from wheat – which also gives us the word semolina). This cake was difficult to make, and the baking of a Simnel cake for Mothering Sunday and was seen as a test of a girl’s baking skills. However, this cake would NOT BE EATEN until Easter Sunday. Only after WWI did the Simnel cake begin to be treated as an Easter cake in its own right. Originally, this cake was decorated with fresh flowers. The decoration with eleven marzipan balls is a Victorian addition. There are several different recipes for this cake, but we have chosen the modernised recipe for the “Shrewsbury Simnel”. Cream the butter and sugar together. Sieve the flour, baking powder and mixed spice together. Beat the eggs and add, one at the time, with a spoonful of the flour, into the butter and sugar mixture. Add all the other ingredients and fold in carefully. Make the almond paste by mixing almonds, icing sugar and sugar together. Add the lemon juice, almond essence and enough egg to form a fairly dry paste. Cut the almond paste in two, and roll out one half to the size of an 8-inch diameter cake tin. Put half the cake mixture into the greased tin, then place the almond paste layer on top before adding the rest of the cake mixture. Bake in the oven at 150° C for 2-2½ hours. Press the cake with a finger; it should be firm when cooked. Allow to cool in the tin before turning out. When completely cool, decorate with remaining almond paste. Shropshire is one of the counties claiming to be the originator of Easter biscuits. Here is the final one our Tudor Easter recipes; a slightly more modern version of the original. Rub the butter into the flour and add the sugar, grated lemon rind, allspice, baking powder and currants. Make into a dough with a little of the beaten egg. Roll out the dough to a thickness of ¼ inch and cut into biscuits. Bake on a baking tray for 20 minutes at 180° C. Remove them from the oven, dust with sugar and leave to cool. We hope you have enjoyed this fascinating glimpse into the world of the Tudor kitchen at Easter – a time of great religious and family celebration. Why not have a go at one of our Tudor Easter recipes, and if you want to show your culinary mastery to the world, do post a picture of your image on The Tudor Travel Guide’s Facebook page or Twitter account to enter into this month’s entirely fun competition for Star Baker! Last month’s recipes were all about the beginning of Lent and Shrove Tuesday. So we were making pancakes with some yummie ingredients, including wine and ale! Check out the blog if you fancy giving them a go. Next month’s Great Tudor Bake Off Challenge will be themed around Katherine of Aragon to celebrate the release of the new Starz series, The Spanish Princess. So stay tuned!